MWM NEWS BLOG: Wired 20.03 : Famous Pirate Flags. Wired 20.03 : Famous Pirate Flags. Last month I had the pleasure of working with my friends at Wired Magazine on this graphic narrative about famous pirate flags. I was asked to design 6 of them. They needed to be quite simplistic since they would appear in print about the size of postage stamps across the bottom of an article (see below for configuration). This forced me to look at it more as a Logo Exploration than a Vector Illustration project. I really enjoy these projects that get me thinking in new ways, and over the years Wired has been like a team of mentors. Thanks Margaret & Tim! Grateful for all the meaningful critiques and guidance. Also check out my Wired Illustrations Archive and the last Mega 20 Project I did with them last Summer. 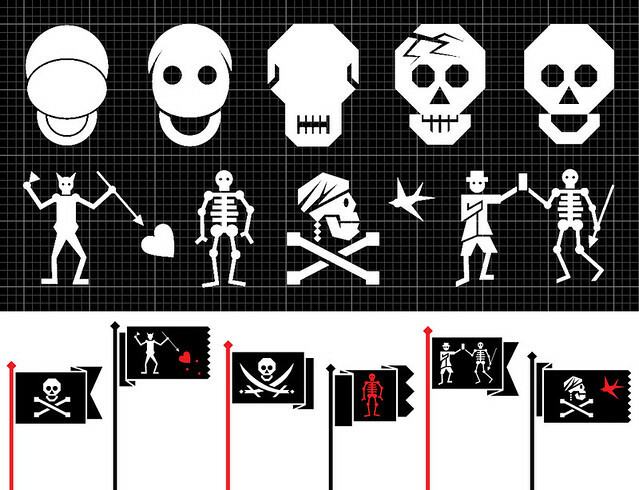 Here's a funny set of evolutionary skulls from the early stages of dialing in the right level of detail. Some didn't even get features before I gave up on them. Toothless octagon for the win!